But first, have you read my self-driving vs luxury safari lodge article? If not, you definitely need to start there. There is no wrong time to visit Kruger and drive around on safari, but there are different things to expect in each season. Winter is considered the better season to go for a couple of reasons. 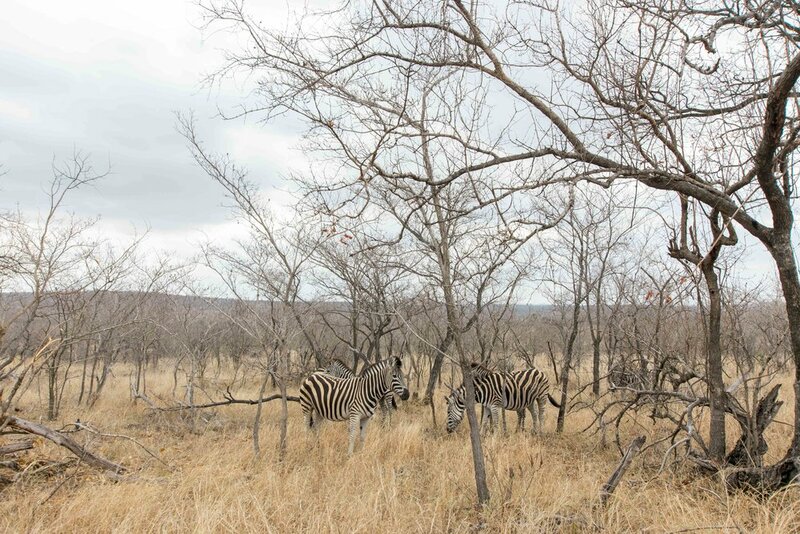 The dry season produces sparse trees and very low grass making it easier to spot animals. Also, most of the rivers and streams are very low, or completely dry, so driving to the few remaining watering holes makes for excellent viewings. The lower season in Kruger, you will probably find better rates at hotels, lodges, and tours. But, it is a bit harder to spot animals when the African landscape is so lush and full. Honestly, though, the landscape alone is a gorgeous thing to experience. And it's not all bad news, you also have a better chance of spotting newborns during the wetter summer season. The weather will be much hotter with temperatures reaching 40 on some days. Humidity will also be quite high. Expect frequent rain. Usually the most popular question, this is always the hardest to answer. Diehards will say you can spend weeks here, tracking animals and experiencing nature. From my personal experience, I spent a total of 4 days in Kruger and as our time came to an end I was ok with leaving. 4 days was easily enough time to see all of the big 5 a couple of times over. But, do remember each experience is different. I will say that if you are self-driving through the park I wouldn't spend any less than 3 full days in the park. 5 full days is my max. You want enough time to really explore and give yourself a chance to see as many animals as possible. If you are staying in a lodge, 2-3 full days is more than enough. There are a couple of different options when it comes to getting to the park. They range from cheap to very expensive. Cheapest: Fly into Johannesburg (JNB) and rent a car. The drive from JNB to (the southern part of) Kruger takes around 4-5 hours. Do be aware, it isn't the most exciting drive. The first three-ish hours are on a very straightforward highway. The remainder of the drive is pretty easy as well, but still pretty boring. Although it does get a bit more scenic near the end. Also, even if you are arriving early, don't expect to make it to Kruger in time to do any major safari driving. More Convenient: You can fly into a big airport like Cape Town or Johannesburg from home and then take a smaller plane to a regional airport closer to Kruger like Nelspruit or Hendrik Van Eck. This is the way I would choose to get there. Most Expensive: From any major airport in Africa you can charter a private plane to take you to one of the private airstrips, like Skukuza Airport, near Kruger. My Personal Experience: This is the way I choose to get to Kruger and I probably wouldn't do it again. Instead, I would spend the extra money and take a smaller plane to Nelspruit. (more on that below) My first day I arrived into JNB at 7 am. We wasted no time picking up the car and immediately got on the road by around 8/830 am. Our first stop was Lion Sands Ivory Lodge, and we drove as fast as we could and still didn't reach the hotel until 3:30 pm. My GPS said it would take us 5 hours tops and it ended up taking almost 7 hours. The way back was the same issue. Although, GPS is a good estimate for travel always add on my hours since you will have to stop for gas, as well as navigate the dirt roads close to Kruger. Ok, first things first, Kruger is HUGE. Like enormous. Kruger measures almost 19,000 sq kilometers making it a little bit smaller than Belgium, and almost the size of New Jersey! Picking a specific area of Kruger and getting a plan together before you head there is essential. Because Kruger is so big different regions of Kruger will be vastly different from each other. That doesn't only mean landscape, but plant and wildlife as well. I am definitely not an expert on the different regions so click here to learn more about each region. Including what animals are in each region and what the landscape is like. My Personal Experience: I went to the southernmost part of Kruger park (entering through the Paul Kruger gate) and had a wonderful time. I saw all of the big five along with many other species of animals and soooo many birds. I went here because it was (1) the easiest place to reach from Johannesburg airport and (2) I read online it was the best place to see the big five. The only way to get inside the park is passing through one of Kruger's ten gates. The gates are spread out along the length of the park. A good rule of thumb is that the gates open at sunrise and close a bit before sunset. You can find a full list of entrance times for each gate to Kruger here. Be aware that those gate closing times are VERY real. While they won't lock you inside the park overnight if you get to a gate late you will be fined. Protip: If you do arrive at a gate late for closing try to explain to them that a pack of elephants was blocking the road and you had to wait for them to move. This was a tip told to me by one of the hotel owners and while you should never be late to a gate on purpose (seriously don't do that) it can help you avoid a hefty fine if you run behind schedule. There are two different ways to pay for entrance to Kruger National Park, you can choose to pay per day or you can buy a WILD card. Click here for a conversion calculator for ZAR to USD. Be aware: There are different rates for South African citizens and for foreigners. I have listed prices for foreigners below. Family: ZAR 4,130.00 Up to 7, Max 2 adults. 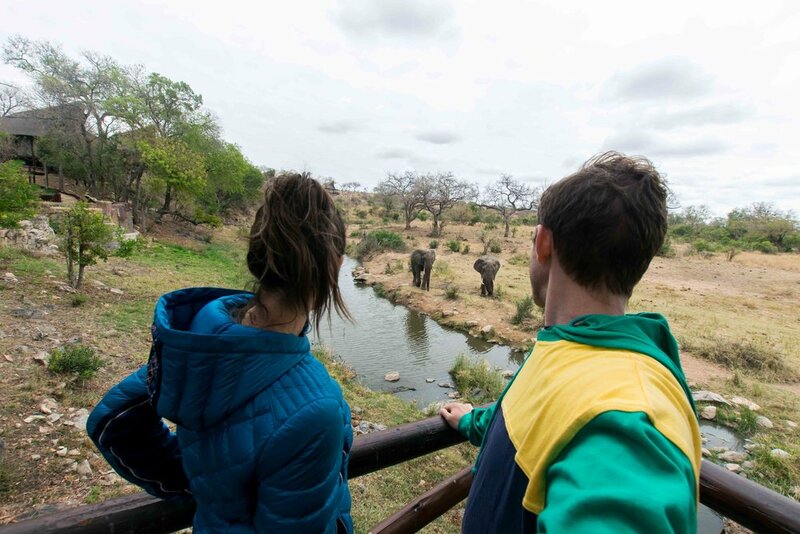 The Wild Card gives you unlimited yearly access to 80+ Parks and Reserves around Southern Africa. There are many different options for the Wild Card but internationals may only purchase an International All Parks Cluster unless in possession of a valid South African residency/work permit. Look at how many days you are going to be inside the park and who you are traveling with to decide which way makes sense for you. You don't have to pay for a gate pass ahead of time. Simply show up at the gate and go inside the hut to fill out your forms. Once you pay you will receive a pass to get in and out of each gate. Expect them to check the trunk and look inside your car when traveling through the gates. Driving inside of Kruger park is relatively easy. The main road running through the park is paved. Sprouting off the main road are various smaller, well-maintained dirt roads. Do be careful estimating driving times while inside the park. Many will overestimate how fast you can and will drive. The main road (paved) has a speed limit of 50 km per hour and the dirt roads a speed limit of 40 km per hour. These are already pretty leisurely paces but most of the time you will be driving even slower, looking for animals, or completely stopped staring at an animal! You don't need a 4x4 to drive through the park. Like I stated above, the main road in the park is completely paved and the side roads are extremely well maintained. When renting a car you definitely want to opt for unlimited mileage since most of your day will be spent driving (sometimes in circles) trying to spot animals. If you don't bring a guidebook along with you I suggest buying the Tinkers Kruger Park Map & Guide. Pictured to the left, this thing was a lifesaver so many times. It has tons of maps and information to help you navigate the park. Plus, it has a great checklist in the back so you can mark off all the animals you see along the way. You can buy this at any of the shops in or around Kruger for around $10. Do be aware that all these items are available for purchase at the Parks shops. For a full guide on packing for South Africa check out this article. Once you are inside the park there are shops for everything you could need. Gas: There are many gas stations available once inside the park but they can be spread out. If you see a gas station fill up, don't let your tank get too low. Food: There are many retail shops found in every campsite. Inside the retail shops are normal souvenirs but you can also find food, drinks, wine, even coal to make your own braai (bbq). ATM/Banks: These are found few and far between, pretty much only at the big camps like Skukuza and Letaba, so make sure you hit an ATM in one of the bigger cities. Picnic sites: There are a couple of picnic sites around the park that have food for takeaway and a nice area to sit and eat. Restaurants: There are pretty nice restaurants in many of the camps that offer sit down or takeaway meals. The first two let you have the unique experience of sleeping in Kruger park. The last option is a good choice for those sticking to a budget. There are many hotels near the gates or close by in a wide range of prices. Each camp has different types of accommodations and not every camp has all of the styles listed below. Campgrounds will sometimes include a pool and laundry facilities. All campgrounds have a main store and even a restaurant. Here is an article showing you what the inside of a camp looks like. Camping – You must bring your own tent. Around $20 per night. Safari Tent – 2 or 4-bed tents with fridge and braai. Communal camp kitchen and bathroom. Around $45 per night. Hut – Single room. Communal kitchen and bathroom. Around $40 per night. Bungalow – Single room units with fridge. Some may have ensuite. Some may have a kitchenette. Around $100 per night. Cottage – These may be single or multiple room units with ensuite and fully equipped kitchens. Around $160 per night. Remember, prices for accommodation in Kruger will change according to season, camp and style of accommodation. Above prices are a ROUGH estimate of what to expect. To book your accommodations you can do so easily with their online forms. You will want to book as far in advance as possible, especially for the larger and more popular Kruger run campsites. If you are visiting during the high season or a holiday be prepared to book anywhere from 6-12 months in advance. Lodges inside the park are much nicer and pretty expensive. These give you the full safari experience and most come with meals and game drives included in the price per night. Here is a list of all the lodges in Kruger. I stayed in Lukimbi when I visited and had an amazing time. There are a variety of private game reserves outside of Kruger National Park. These have great accommodations as well. One of the most famous Sabi Sands is located near south Kruger park. I had a chance to stay at Lion Sands Ivory Lodge in Sabi Sands reserve and had a wonderful time. You can read my full review here. These bright colors are really things we wore on safari, we asked our guide and he said it really doesn't matter. If you are self-driving realize that most of the day you will be sitting in your car. Especially since it is against the rules to get out of the car at any point other than a camp or picnic area. Dress comfortably and warmly if the season calls for it. Try to cover your arms and legs just in case a couple of mosquitos get in the car, more on malaria below. We saw many people dressed in camouflage or colored safari gear and it just isn't necessary. If you are taking a game drive tour or staying at a lodge you will be driving in open air vehicles. Most come with blankets if it is chilly out but make sure to pack layers. When the car is moving it can get really cold. Kruger National Park is a malaria risk area. BOLD Do understand that the risk of contracting malaria is low, BUT it is still best to take preventative measures. You can choose to take anti-malaria medication, but it does come with side effects. This is also just one measure to reduce risk. Bite prevention is still the main and BEST defense against contracting malaria. Malaria-carrying mosquitoes are most prevalent between dusk and dawn, so especially during those hours, cover up. Want to plan an epic trip to Kruger National Park? Read on to find the answers to all your questions!